Repairing narrow cracks in concrete is fairly simple. Just remove loose debris and use a caulking gun to fill the crack with a masonry crack elastomeric filler. You can also use a vinyl concrete patching compound, applied and smoothed with a putty knife. Wide cracks are a little trickier and require a little more work. Start by actually widening the crack at its base and removing the debris. Next, use a trowel to fill the expanded crack with a concrete patching compound and tamp it down to remove any air pockets, smoothing the mixture with the trowel to finish the surface. Once the compound sets, you can brush or texture the patch to match the existing surface. Spalling is a condition that occurs primarily because of improper installation, combined with environmental factors. Spalling is easy to spot: the surface will become rough and flaky, and may pit. In some cases, chunks of concrete break loose from the installation. The concrete can also start to crack, especially if large chunks break off. The best time to address spalling is when concrete is first poured, taking steps to prevent it from occurring in the first place. The concrete should be mixed with the right amount of water and ideally the mix kept as dry as possible because a high water content can weaken the material. It also needs time to cure properly. Sealing the concrete can also protect it from the elements. There are a number ofÂ sealantsÂ available for concrete, including ones that will work with a decorative finish. To address the problem after it has occurred requires covering the entire affected area with a polymer-modified cementitious overlay in a color matching the existing driveway. Once the overlay cures, apply a waterproofing sealer to prevent the problem from reoccurring. 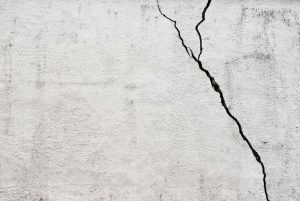 To learn more about the problems of cracking and spalling concrete and how to properly address them, contact the concrete experts here at Concrete Solutions. ← Sealing and waterproofing products for concrete and masonry – what’s the difference?